Bhubaneswar, September 9: The future technocrats of India and world, IITians from IIT Bhubaneswar were on a different mission. 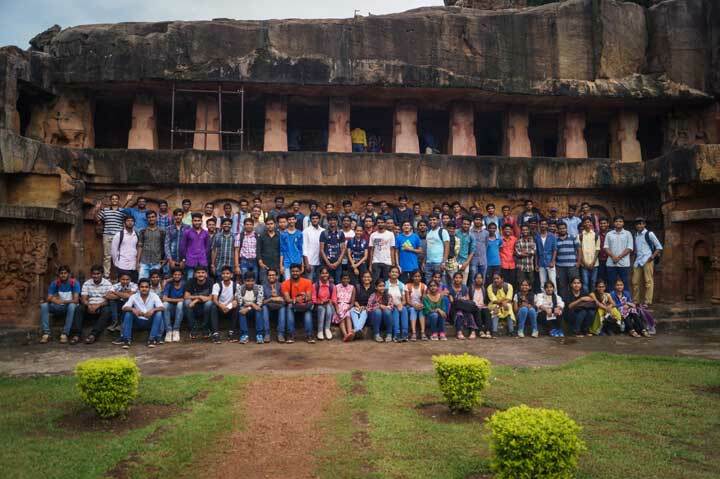 Nearly 100 students with their faculty members and staff from Argul came to Udayagiri-Khandagiri Twin Hills today as part of their cultural outreach programme and joined the heritage walk – Monks, Caves and Kings under Ekamra Walks. Apart from the IIT students a small regular visitors’ group including a researcher from Emory University in US Valerie Bauza and IT professional from Bangalore Bandana Rani Rauta from Legato Health Technologies were there. Sweta Kumari, also from that school was happy to know the stories of monks, caves and kings and how the story of Kalingan empire was linked to the story of the Twin Hills and how emperor Kharavela during his supreme rule enhanced the territory of Kalinga to more than 40 percent of today’s modern Indian territory. Purimetla Naresh Babu from Electronics branch was overwhelmed to see the ancient caves, which were once the epicenter of Jain religious activities and spiritual in the spiritual renaissance past when Jainism was patronized by the rulers of Kalinga. Yeddula Kavya, also from Electronics branch termed the experience as a new experience for the young students who want to explore more of Odisha as it was once an epitome of Indian cultural, architectural and economical progress with world heritage site like Konark and a rich maritime tradition with lands in the South East Asian region.